Kevin A. Malone was born in Utica, New York, on July 23, 1952, and as a youngster moved with his family to Pompano Beach, Florida. He graduated from the University of Florida in 1973, where he was honored as a Phi Beta Kappa. While at the University of Florida, he was elected President of the Student Senate and a member of the Florida Blue Key. He graduated from the University of Florida Law School in 1976. Following law school, Kevin became an associate with Krupnick & Campbell and, after several years of outstanding successful trial results, was named a partner in 1979. In recent years, Kevin has specialized in representing foreign governments in litigation in the United States. Over the past 10 years he has represented more than 25 foreign governments in litigation matters throughout the United States. Kevin has been lead attorney on several significant environmental cases involving toxic chemicals. He represented over 200 farmers against E.I. DuPont de Nemours and Company, Inc. in regard to its fungicide Benlate®, and after two successful trial verdicts, achieved settlements for his clients in excess of $200 million. Over the years, Kevin has developed expertise in air-crash disaster cases and particularly in the area of forum non conveniens law. He has served on the Plaintiffs' Steering Committee for numerous major airline crashes, including the Avianca air crash in New York in 1990, the American Airlines crash in Cali, Colombia, in 1995, the ValuJet air crash in Miami, Florida, in 1996, and the American Airlines crash in Queens, New York, in 2001. He has also served as lead counsel on a large number of air-crash cases involving light aircraft, helicopters, and military aircraft. Kevin is a member of the American Bar Association, the Federal Bar Association, and The Florida Bar. 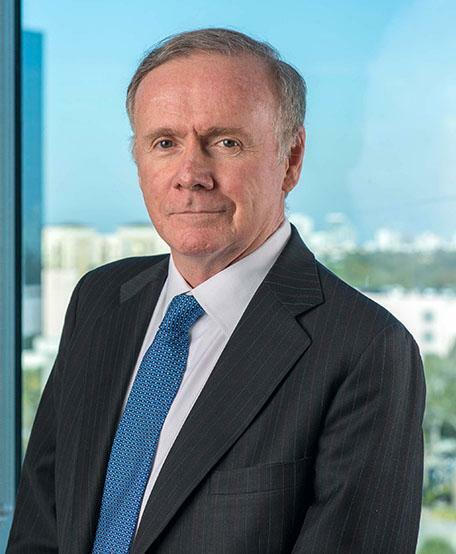 He is also a member of the Broward County Trial Lawyers' Association, the American Association for Justice, and the College of Diplomates of the Academy of Florida Trial Lawyers. He is board-certified as a Civil Trial Lawyer by The Florida Bar. Kevin is also listed in the publication, The Best Lawyers in America, and he has consistently received an AV rating by the Martindale-Hubbell Law Directory, which is the highest rating given by this publication. Kevin has been appointed as a member of the Selection Committee for the appointment of a Federal Magistrate for the United States District Court for the Southern District of Florida. He served as review editor for the "Recreational Vessels" chapter of Florida Torts, First Edition, published by Matthew Bender Legal Publishing Company. He is a frequent lecturer at trial-lawyer seminars in his specialty areas of civil RICO, aviation, admiralty, scuba diving, environmental torts, and complex product liability cases. Actively involved in community and environmental causes, Kevin is a member of The Nature Conservancy, the Wildlife Conservation Society, and he serves on the National Council of the World Wildlife Fund.